MIT graduate Robert B. Laughlin PhD '79 shared the Nobel Prize in physics this week with two other researchers. Laughlin, a professor at Stanford University, shared the prize with Horst L. St�rmer of Columbia University and Daniel C. Tsui of Princeton University for their work in discovering the fractional quantum Hall effect. The prize includes $978,000, which will be divided among the three recipients. 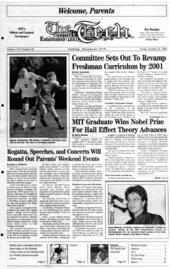 Despite Laughlin's connection to MIT, it has been three years since an active member of the Institute has won a Nobel. In 1995, Professor of Chemistry Mario J. Molina shared the Nobel Prize in chemistry for his research on ozone depletion. All three researchers were working at Bell Labs in 1982 when St�rmer and Tsui discovered the effect. In 1983, Laughlin, then at the Lawrence Livermore National Laboratory, provided the theoretical explanation of the effect in terms of fractionally charged particles. It was a "confluence of things from engineering that prepared me for understanding the fractional quantum Hall effect and coming up with an explanation," Laughlin said during a television interview at Stanford. The fractional quantum Hall effect is the latest addition to a set of theories, the first of which was formulated in 1879. The Hall effect was discovered in the 19th century by Edwin H. Hall. It deals with the deflection of an electric current by a perpendicular magnetic field. In 1980,Klaus von Klitzing discovered the integer quantum Hall effect, in which normal Ohmic resistance disappears, and coherent quantum-mechanical effects cause the resistance to be quantized in integer multiples of a fundamental unit of resistance as the magnetic field is varied. In essence, the resistance of the deflected current increased in a quantum, not a continuous, manner. Von Klitzing won the Nobel Prize for this work in 1985. In 1982, St�rmer and Tsui, working with extremely pure semiconductor samples, discovered additional fractional quantized resistance values. These fractional values always had odd denominators. This discovery came as a great surprise. It was known from the outset that the fractional quantum Hall effect could not be explained without dealing with inter-electron interactions in the sample. Initially, a theoretical explanation was not forthcoming. In 1983, Laughlin developed a theoretical picture of the phenomenon, even writing down an explicit multi-particle wave function. His theory predicted that the fractional quantum Hall effect was caused by the capture of an odd-number of fundamental units of magnetic flux by each electron, as opposed to a single unit of flux in the integer quantum Hall effect. The correlation of odd numbers of magnetic flux quanta with electrons created combined pseudo-particles that obeyed Bose-Einstein statistics, as opposed to the Fermi-Dirac statistics obeyed by normal electrons. Bose-Einstein particles exhibit condensation properties that results in many important states of matter, including superfluid helium, superconductivity, and the quantum hall fluid. Laughlin's theory predicted a new form of quantum-mechanical fluid. He also predicted that the elementary excitations of the fluid involve pseudo-particle charge carriers with charges that are fractions of the electronic charge. Last year, other researchers observed these fractional charge carriers directly, providing the first experimental evidence of mobile charges smaller than the charge of the electron. The fractional quantum Hall effect remains a major topic of research in low-temperature condensed matter physics. The existence of fractionally charged pseudo-particles makes it an important theoretical topic as well. Also of theoretical interest is what occurs when an even number of flux quanta are associated with each electron. This configuration preserves the Fermi-Dirac statistics, but the electronic fluid has many interesting properties in this state. Also, the correlation of non-integer numbers of quanta with normal particles could lead to the existence of particles obeying different statistics than every previously observed, but which have been a topic of theoretical interest over the last fifteen years.